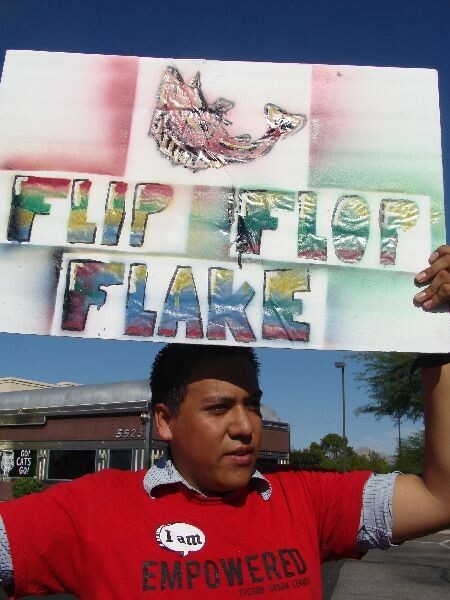 Mari Herreras DREAMer Josue Saldivar protests at Jeff Flake's Tucson campaign office. The crowd outside of Jeff Flake's Tucson campaign headquarters resembled a job fair, with people telling the woman who stood in the doorway their GPAs, class standing and other academic achievements. The 13 young women and men from Undocumented Youth in Action showed up at Flake's headquarters, near Grant and Craycroft roads, on Saturday, Oct. 20, to invite him to a town hall in Phoenix being organized by undocumented youths in Arizona. They had just finished protesting along Grant, holding up signs that said "Flip Flop Flake" and "Shame on You Jeff Flake for Killing Dreams." Carlos Martinez, 30, perhaps the oldest in the group, told Julie Katsel, Flake's Southern Arizona director, that he went to school at the UA, was recognized as one of the school's top Hispanic engineering graduates, and went on to get a master's degree in computer engineering. But because he came to Tucson when he was a 9-year-old without documentation, he's worked cleaning yards the past seven years. However, Martinez said he expects his line of work to soon change, because he was one of the first people in the country to apply for and receive the Deferred Action for Childhood Arrivals work permit, the program enacted by President Barack Obama after Congress failed to pass the DREAM Act, which would have allowed students like Martinez a path to citizenship. Deferred-action permits allow the holder to work for two years without facing deportation, although there is no path to citizenship with the permits. Martinez said response to the program from undocumented youths has been overwhelming. According to a recent New York Times report, the U.S. Department of Homeland Security has received 180,000 deferred-action applications, and so far, more than 4,500 have been approved. As Martinez and others shared these statistics, Katsel told the group she wanted to write down all of their comments and names for the congressman. Dario Andrade was next, explaining that he graduated from high school in May with a 4.0 GPA and is a founder of Undocumented Youth in Action. But he can't get into college, he said, because he's undocumented. "I'm stuck," he said. Katsel noted that the invitation to the Phoenix town hall handed to her didn't have a date. Organizers explained that they want to hear back from Flake with a date that works for him. "We want him to know we are not a political football you can play with," Andrade said. "We want him to come to the town hall in Phoenix and speak and let us know why the Latino community should vote for him." Flake is running for retiring U.S. Sen. Jon Kyl's seat. His Democratic opponent is Richard Carmona, who has said he supports comprehensive immigration reform as well as the DREAM Act and the president's deferred-action program. It is Flake's record on immigration that the students said they want the six-term congressman to clarify. In the past, Flake was perceived by many as a moderate who supported comprehensive immigration reform. But two years ago, he voted against the DREAM Act. And in 2011, Flake changed how he discussed immigration, with him focusing more on U.S.-Mexico border security. Critics said the change came about because his campaign needed to appeal to hard-liners on the right. In a press release explaining his December 2010 vote against the DREAM Act, Flake said, "I continue to support comprehensive immigration reform—the country, particularly Arizona, is in desperate need of it. However, legalization measures need to be coupled with increased enforcement and a temporary-worker program. By moving ahead with legalization alone, Democrats have little incentive to support increased enforcement and a temporary-worker program, and without those components, we've not truly addressed the problem." Martinez took out his deferred-action permit, an identification card he expects to provide him with a new life. He's sent out more than a dozen résumés to companies like Google, Microsoft, ESPN and Yahoo. "Education was my way out of being poor," he said, explaining that he grew up watching his dad work three jobs to provide for his family. Martinez said having the permit is great, but it's still not enough, which is why he and others showed up at Flake's office—to remind the congressman that people like him also have parents who could be deported any day. "We still need a DREAM Act. We still need comprehensive immigration reform," Martinez said. "I want to talk to him personally and tell him my story. This is the only country we know. I haven't been back to Mexico since my parents brought me here." Lupita Alcaraz was at the protest, too. The 19-year-old said she came to Tucson at the age of 12. She's currently attending Pima Community College. After paying out-of-state tuition this semester, because PCC has yet to pass a policy that allows undocumented residents to pay in-state tuition, Alcaraz hasn't been able to afford the $460 fee for the deferred-action permit. "That's something we are working on, too," Alcaraz said about Pima's tuition policy. "But I hope Flake joins us. I hope he agrees to meet with us. I want him to understand who we are, and I want him to be honest with us." The Tucson Weekly asked Katsel for comment on the invitation, but she referred us to Andrew Wilder, Flake's communications director. As of our press deadline, Wilder had yet to respond to our question asking if the congressman plans to meet with the Arizona DREAMers.